The Travellers Guide has a great selection of 3 star, 4 star and 5 star hotels in Portugal to suit all budgets. Some of the hotels listed below are family friendly holiday accommodation, whilst others are more suited to couples looking for a romantic weekend break or spa holiday. The island of Madeira is part of Portugal and we have a great selection of hotels in Madeira. This beach resort in Caniço, Madeira offers a gym, massage services and beauty treatments. It has 4 restaurants, 3 pools and panoramic sea views. 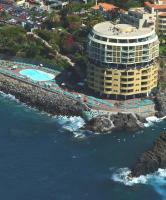 Funchal's centre is a 20-minute drive away. Located in the heart of the historic Funchal City, this guest house is just a 5-minute walk to the Atlantic Ocean. The cathedral and flower market are also close by. The Residencial Greco's airy rooms have high ceilings and wooden furniture. Located in the picturesque village of Ponta do Sol, Enotel Baia overlooks the Atlantic Ocean just opposite a pebble beach with ocean-side jogging path. It features a heated pool with children area. Facilities and services includes a bar, swimming pool, reception open 24 hours, internet corner and elevator. All guest rooms are equipped with bathroom/shower, telephone, satellite TV, air conditioning, kitchenette and balcony/terrace. Centrally located and only 6 km from the airport, Ponta Delgada is a modern hotel decorated with striking furnishings. It features an elevated indoor pool with panoramic terrace overlooking the town. 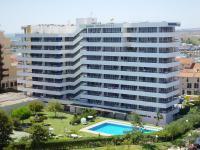 Paraiso Dourado offers apartments with balconies only 300 metres from the beach in Porto Santo. There is a variety of restaurants and 2 supermarkets within a 5 minute drive of the property. Set within a leafy garden, this apart-hotel boasts an outdoor pool overlooking Funchal coastal cliffs. It offers a well-equipped fitness centre with a jacuzzi and dive centre.